One of the more dynamic archival mounting techniques involves “floating” an image in the center of a window mat so that the entire piece can be seen. Here we’re going to cover 4 steps for accomplishing this by using acid-free Cut-Back Corners, which are often the preferred choice for such applications. While we’re going to use the photograph above as an example throughout this blog, this elegant archival mounting technique can be used for just about any flat images or documents you may have in your art or photography portfolio / collection / or family archive, and with just a little practice it can be accomplished by anyone at home or in the studio. 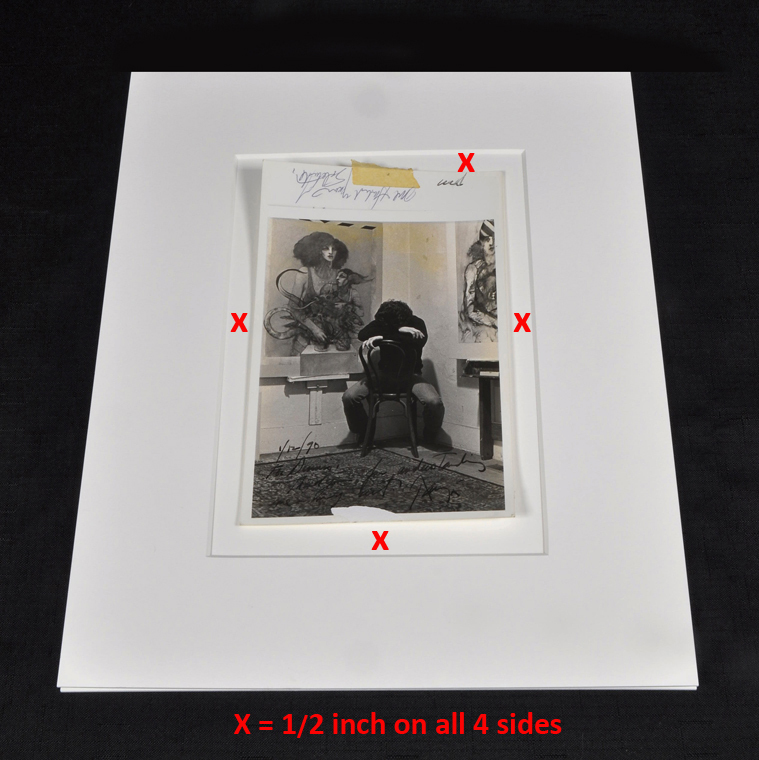 The photograph above measures 5 x 8″, and today we want to “float” the image in the center of an 11 x 14″ mat so that the entire photograph—including the borders which contain written notes—will be visible. While you can choose any amount of space you’d like around your own images, in this example we wanted a relatively small 1/2″ around the entire photograph. To arrive at the correct measurements for our mat’s window, we simply added 1/2″ to each side / the top & bottom of our original 5 x 8″ size to come up with a mat window that measured 6 x 9″, all of which was easily entered into the Custom Mat Cutting template on the Archival Methods website to order the museum-quality / precision-cut mat we’ll be using in this demonstration. Once we had our mat in hand, the first step in “floating” this image was to simply close the mat and place the image in the approximate center of the mat’s window. It could then be gently moved left & right and up & down until it appeared to be exactly in the middle, a process that can often be done “by eye.” You can use a clean ruler to check your positioning, but just be careful not to let the ruler touch the mat as it might accidentally ding or mar it. With an image that does not lay flat, as is the case here, get the image roughly positioned and then go to the next steps that include a DIY (do-it-yourself) “matting weight,” as doing so will often flatten the image out a bit while still allowing you to make precise position adjustments. Before placing a DIY matting weight on top of our image we took a sheet of paper and cut a roughly 4 x 4″ square from it, and then folded the edges up on all four corners of this square (see red box above). 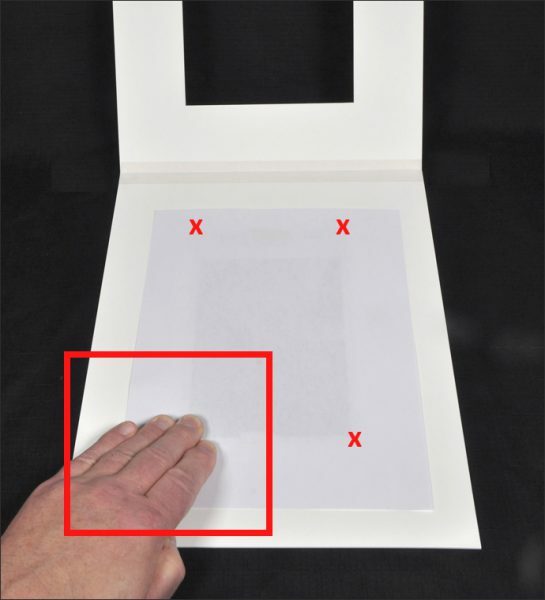 While being careful not to move the now-perfectly-centered photograph, we then gently placed this sheet of paper on top of the image, as shown. While there are professionally-produced matting weights available out in the world, a DIY solution using a short can of cat food or tuna (the cans with the rounded edges on the bottom are best) works just as well to keep our image exactly where we had positioned it ahead placing our mounting corners. As shown above, there are essentially two styles of mounting corners available: a Standard Corner and a Cut-Back Corner. Here we’re going to use Cut-Back Corners, as they’re perfect for “floating” our image in the center of its mat, and it will allow us to see as much of the image as possible while providing a strong & secure—yet completely removable—archival mounting solution. 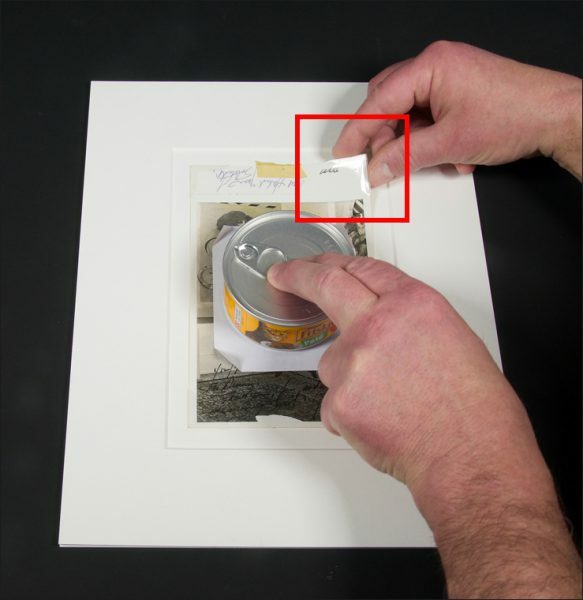 “Practice makes perfect” when it comes to using either of these types of mounting corners, so work through the following steps with some scrap paper and mat board before you attempt to mount an actual piece in the expertly-made mat you may have just ordered. There are two things to note in this photograph of a Cut-Back Corner that is ready to be used to mount our photograph. 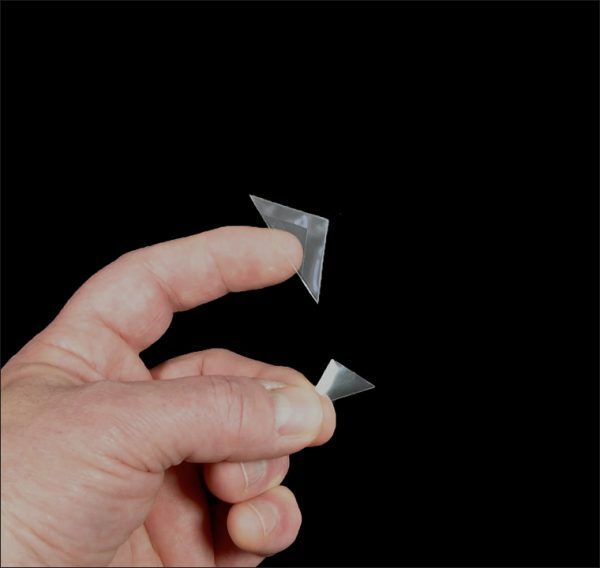 First, notice that the corner is stuck onto the very end of the fingertip with the smallest amount of contact between the finger and the corner. This will keep as much of the corner’s adhesive “clean” and free of finger oils that are present even on the most well-washed hands. It will also keep fingerprint impressions off the adhesive at the edges of the corner where they might be noticeable in the finished matted piece. Secondly, the smaller triangle below the corner is the extra material left over from die-cutting when the corner was made. This needs to be removed from a Cut-Back Corner and discarded before we attempt to place the corner on the piece being mounted (this is not an issue when using Standard Mounting Corners). After checking once again that our image is exactly centered, we’re applying a gentle pressure to the can in the center of the image to keep it from moving and then lifting up one corner of the image with a finger to slide our mounting corner into place. Then we’re using our thumb and forefinger—as shown—to hold the corner square against both the top and side of the image as we gently lower it down onto the mat’s backing board. There is no need to press the corner down firmly at this stage—we’ll address that in a moment—as gentle pressure should be enough to keep our image and its corner in place. 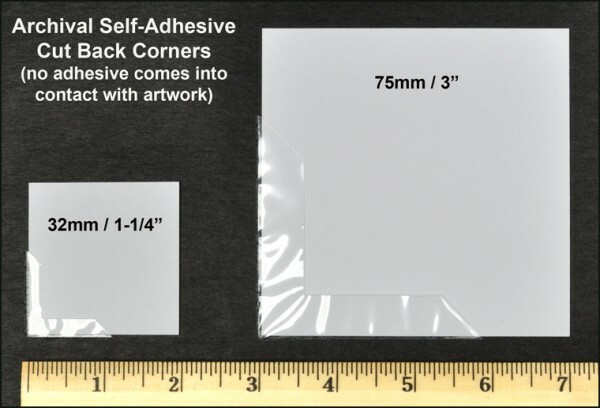 Since both Standard and Cut-Back Corners employ permanent adhesives that are very sticky, removing a misplaced corner can be a challenge, so getting your corners positioned correctly the first time is important (as mentioned, practice with scrap paper & mat board ahead of time). A well-positioned Cut-Back Corner, evenly spaced within the mat & square with the mat’s corner. Also be mindful of any image movement during this process. 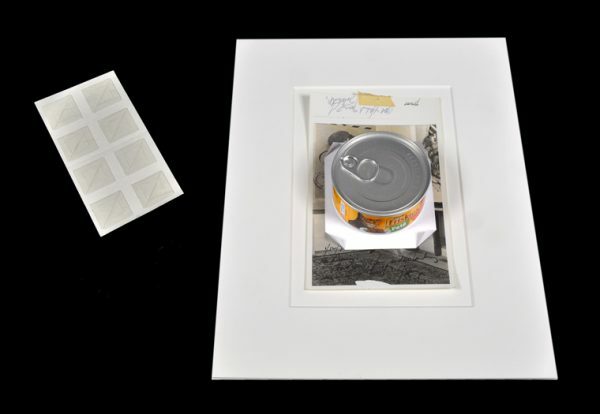 If your image has moved then remove the mounting corner your currently working with from the image before it comes into contact with the backing board, discard that corner, and start over by removing the can of cat food and cover paper and repositioning your image. Once we have the first corner in place there is still the opportunity to check our print’s alignment within the mat and to make small adjustments, but once we have two or more mounting corners in place this becomes more difficult. With all four mounting corners in place, we’ve gently removed the can and cover paper—we had folded the corners of this paper sheet up earlier to make this step easier—and our image is squarely mounted, with no indentation from the can because we used the right amount of gentle pressure on it (and it had a rounded bottom). At this point we’ve opened the mat, after making sure that the front of the window will be resting on a clean / dry surface. We’ve placed a full sheet of paper over our mounted image as shown above and then applied moderately firm pressure on each mounting corner (red X‘s above) to ensure good adhesion to the mat’s backing board. 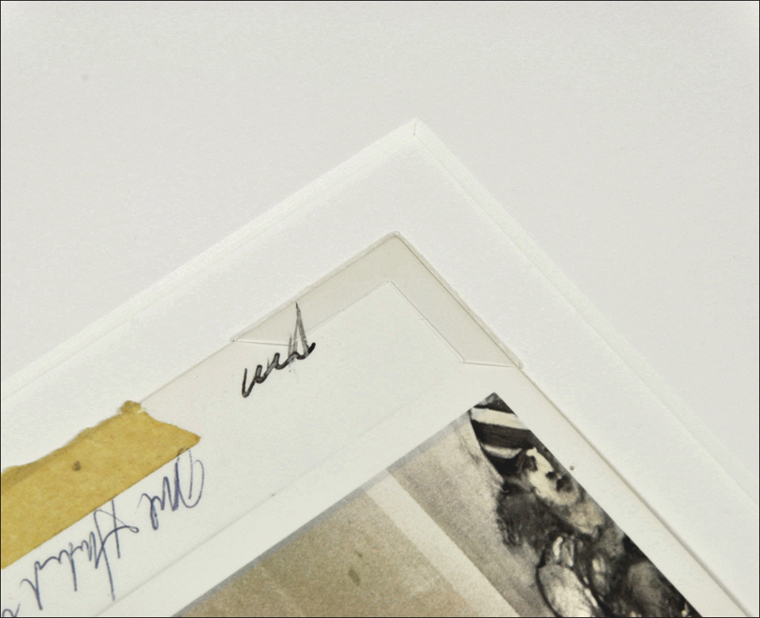 There is no need to burnish the corners down, as Archival Methods’ Mounting Corners will stay in place for the long term. 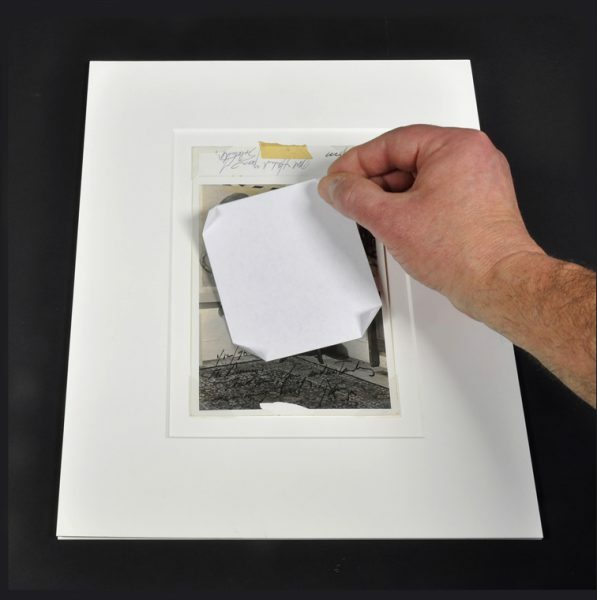 When finished we have a professional-looking / museum-quality archival mounting presentation that will withstand the test of time, all while allowing us to easily remove the image by simply flexing it slightly until it pops out of its corner, with no need to try and remove the mounting corner itself. 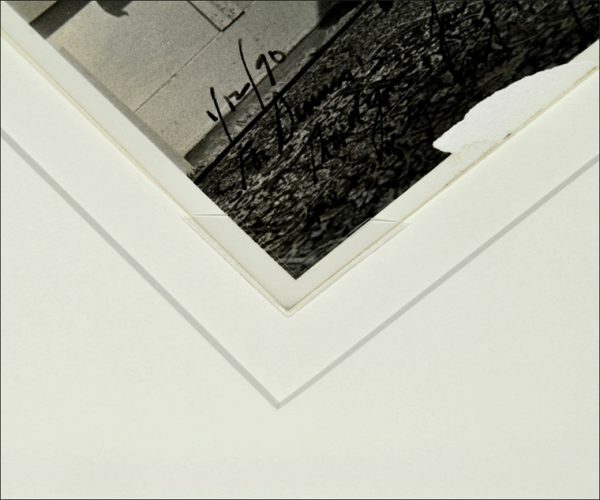 The end result of this type of archival mounting procedure—which works for both “floated” images and standard behind-the-mat-window mounting—is a clean, accurately-positioned piece that is ready for placement in a fine portfolio or the frame of our choice. Got additional questions? 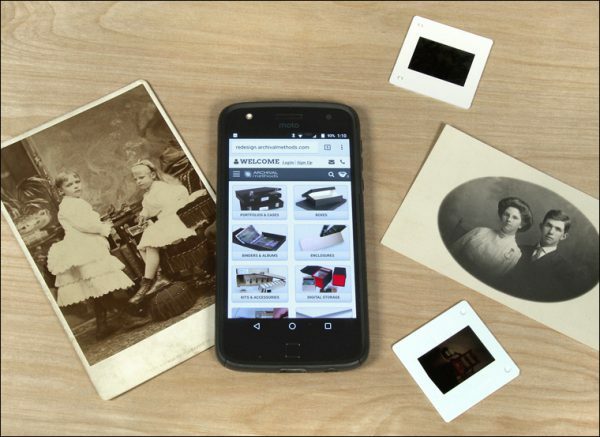 Call or email us here at Archival Methods for all the answers! Looking at the last photo above, I am curious whether we can make the mat window smaller so as to conceal the ugly mounting corners?